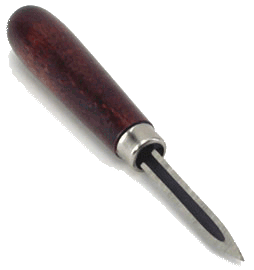 A Bearing Scraper is a hand-held tool with multiple sharp edge blades for leveling out high spots on soft metal engine bearings. Most often a Bearing Scraper is easily identified by a three edge design. 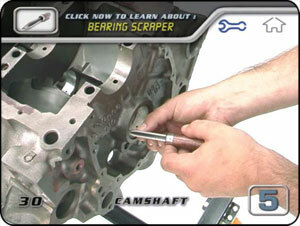 A Bearing Scraper is not normally used to dig out deep pockets of babbit or soft metals of an engine bearing. A Bearing Scraper is more effective when used to lightly scratch thin even areas of an engine bearing that have been identified as 'high spots' after a test fitting and test rotation of a camshaft once the camshaft bearings have been changed. In extreme cases a Bearing Scraper can be used to scrape the bearings of Crankshaft Main Journals or Rod Journals, but care needs to be used to limit the amount of material removed from any crankshaft bearing surfaces because the crankshaft spins at double the RPMs of a camshaft. In the "Pre-Assembly" section of our DVD, we installed the camshaft with bearings and tested to make sure it rotated smoothley. After inspecting the bearings there were some high spots that were rubbing against the cam too much. We used the bearing scraper to shave away small amounts of the bearing in order to stop the cam rubbing too much and keep the rotation smooth. Be careful the edges of a bearing scraper tool are very sharp.